We’ve had a luvvie’ly time this month with a TV crew here one day and a brace of radio reporters the next. 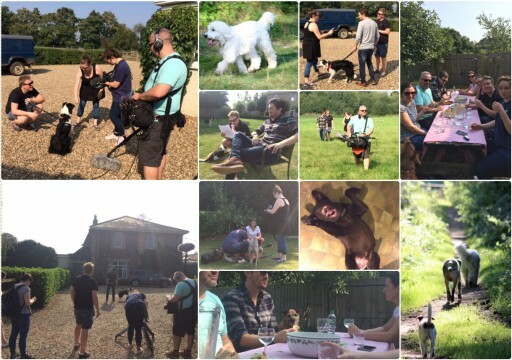 The 9-strong TV crew from Wales descended on one of the hottest days of the year, took over the house, gardens and kitchen – and spent the day very busily filming A Life in the Day of their Collie Jessie who was staying at the House of Mutt. Jessie was very excited by the whole thing – strange as she’s a seasoned film star apparently – as our dogs wandered around sniffing sound booms, stealing snacks and sleeping soundly in the sun whenever they were given the opportunity. I think the long walk they had pre the onslaught, combined with the sun and rather endless ‘takes’, made them pretty (wonderfully!) blasee about the whole experience! It will be part of a series on dogs that’s coming out in the Spring. I’ll add a link to Mutterings when it’s Out There. Meanwhile, a big thank you and ear tickle to the real stars of the show: Milo, Ivo, Borgo, Frankie, Bonnie, Franky, Herman, Lindo, Hubble & Hippo. The following week we got a call from Radio 5 Live wanting to come and interview us about a current news item on the breeding of Brachycephalic dogs. (Listen…) An early alarm call the next day followed by being live ‘from the kitchen’ at 7.15am, led to another interview with Radio 4′s You & Yours later that day (Listen…) ; and a visit from BBC Radio Norfolk the next (Listen…). Widget contributed gamely to every radio interviewer who thrust their mic towards her – ‘background barking’ was apparently a good thing, and she was happy to have her say! Phwew, sorted. Now back to anonymity/obscurity/dog walking!